12/22/2009 UPDATE: For a recently published article inThe Nation magazine, please read "America's Secret ICE Castles." For a list of ICE subfield offices and their phone numbers sent to me in response to a FOIA request, please go here. One of the places we stopped was an address on several of the documents issued Mark from an ICE office in Cary, North Carolina. When we first arrived at the industrial park in a suburb of Raleigh, I thought google/maps had led me astray. 140 Centrewest Court was just next to a production plant for Oxford University Press, and off a main road with some gated communities. There was no sign indicating an ICE facility. We continued toward the end of the road and found ourselves behind 140 Centrewest Court, at the far end of the development, adjacent to at least 15 unmarked white vans identical to the one we'd seen in front. There was no sign anywhere indicating that this was a government building, much less a place where people were being held by ICE in transit to larger facilities. Though there was a sign suggesting one might be given travel documents. When I returned to Berkeley I called up some folks to see if I could learn more about these secret sites. Kathy Purnell, an Immigrant Rights Fellow at the ACLU in Georgia told me that she'd read something about them in a recent report by Dora Schriro, "Immigration Detention Overview and Recommendations" (October 6, 2009). According to the report, these offices are used to hold people for up to 12 - 16 hours and are used for "84% of all book-ins." The subfield offices are below the legal radar so it would be impossible for anyone to know the conditions and if the limits are enforced. I called ICE and requested a list of what the report says are 186 subfield offices. First I was rebuffed. Temple Black, an ICE public affairs officer, checked with his supervisor and told me that these locations were "not releasable." He said the list was "law enforcement sensitive." Around the time he told me this he had a family emergency and left town. Mr. Black put me in touch with someone else at ICE who did release the list to me. The list is not complete (it has 174/186 locations) and at least one of the addresses is not accurate. I have requested a complete list and am waiting for that. I circulated the list to various civil rights and immigrant rights groups, including Detention Watch Network, the ACLU, and Human Rights Watch. I also shared it with about a half dozen attorneys who work on immigration law enforcement. No one had previously seen it. Some of the locations are known detention centers and federal buildings but many are like the place I saw in Cary: unmarked buildings with unmarked cars housing agents who themselves travel incognito. For more on what's happening at these places, and the response from activists and attorneys, stay tuned for an article that will be appearing shortly in a national magazine. Meanwhile, feel free to stop by and say hello. Okay, I guess that's me. 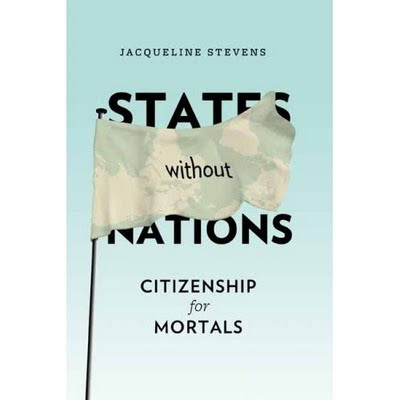 States Without Nations: Citizenship for Mortals may not exist, but the book is now a reality. It was published this week by Columbia University Press as part of its series New Directions in Critical Theory, edited by Amy Allen. Arguing that the core laws of the nation-state are more about a fear of death than a desire for freedom, Stevens imagines a world in which birthright citizenship, family inheritance, state-sanctioned marriage, and private land ownership are eliminated. Would chaos be the result? Drawing on political theory and history and incorporating contemporary social and economic data, she brilliantly critiques our sentimental attachments to birthright citizenship, inheritance, and marriage and highlights their harmful outcomes, including war, global apartheid, destitution, family misery, and environmental damage. It might be hard to imagine countries without the rules of membership and ownership that have come to define them, but conjuring new ways of reconciling our laws with the condition of mortality reveals the flaws of our present institutions and inspires hope for moving beyond them.